“Bambi” escapes not a wildfire but WES trains this morning after TriMet crews spot the little guy sleeping on the main track out of the WES Commuter Rail facility in Wilsonville. The fawn had chosen the wrong place to rest. 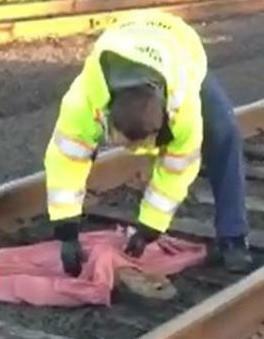 It was found at about 6 a.m. cuddled in the ballasted trackway used by trains to come and go from the rail yard. Video captured WES Vehicle Maintenance Technician Ed Whitaker carefully placing a blanket over the fawn and gently picking him up. As Whitaker walks out of the tracks, the fawn seems to fully wake up and starts to wiggle. He jumps from Whitaker’s arms and makes a run for it. The fawn ran past the fence to an open field where his mom was waiting. WES workers always keep an eye out as there is a deer herd that frequents the area. They’ve spotted two fawns with the herd that they guesstimate are about three weeks old. Despite “Bambi’s” slumber on the tracks, WES morning service was not disrupted.